The Houston Astros began life in 1962 as the Colt .45s, a reminder of the famous six shooter gun. The Colts began playing in the temporarily erected, 32,000 seat Colt Stadium (which was affectionately known as “Mosquito Heaven”), where they would play for their first three seasons. The Colts changed their name to the Astros in 1965 when they moved to the brand new Astrodome. Colt Stadium, which is now part of the Astrodome parking lot, was taken apart in the 70’s and sent to Mexico, where it was reassembled for the Mexican League. The 1962 Colts ended up 64-96 with a group of players taken from an expansion pool, ahead of two other teams to end up in 8th place in the new 10 team National League. The other two teams? The 59-105 Cubs and the 40-120 New York Mets (the Mets were the other 1962 expansion team, and with their 40-120 record set a modern day record for futility). This is a Colts home uniform. 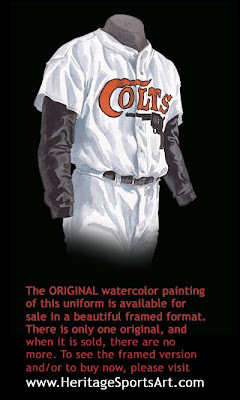 Although perhaps not appropriate for today’s politically correct times, the jersey featured a colt .45 six-shooter, with “COLTS” scripted above it and the “C” of Colts wisping out of the barrel of the gun. Attractive in a simple way, this was a very plain uniform, with no piping or stripes, in fact not much color at all. That would change in a big way in the 70’s! 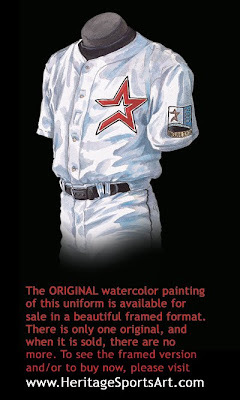 This home uniform was first introduced in 1965 when the team moved from Colt Stadium to the 8th Wonder of The World, the Astrodome, and changed their name to reflect their new home. The name Astrodome and Astros reflected the importance of the country’s space program to Houston, and vice versa. This is still a very simple uniform, with the team name in blue and orange-red outline, and a shooting star symbolizing the “Lone Star State”. The patch on the left sleeve is a futuristic looking insignia with the Astrodome in the middle, baseballs flying around it like atoms and “ASTROS” written underneath. All in all, this uniform works! A note about the Astrodome: The Astrodome was originally built with clear roof panels and natural grass, but the outfielders had difficulty seeing fly balls, and thus the roof panels were painted, which then killed the grass. The solution was a green “carpet” made to look like real grass, and under-padding to cushion the hard floor below. Thus “Astroturf” was born in 1966, a year after the Astrodome opened. In 1968, the Astros’ third season at the Astrodome, the team saw several firsts. The longest 1-0 game in baseball history took place on April 15th when the Astros beat the Mets in 24 innings. The Astrodome’s first and only rain-out occurred on June 15th when a storm prevented the umpires and the fans from getting to the game. Additionally, 1968 saw the Astros host the first All Star game to be played indoors and on artificial turf, and it was the first and only 1-0 All Star game. Unfortunately, 1968 was also the first time in the franchise’s short history that they finished in last place (albeit with a respectable 72-90 record). 1968 was also the first year that the Astros’ expansion twin, the Mets, finished ahead of them (the Mets finished a single game better than the Astros at 73-89). Who could have predicted what 1969 had in store for the Miracle Mets? The Astros 1972 home & away jerseys had something that many teams had already used in the ‘40’s, ‘50’s and ‘60’s and then discarded - a zipper. During the 40’s, 50’s and 60’s many teams used zippered jerseys instead of the more traditional button front jerseys, while a handful of teams wore them well into the 70’s and even the 80’s. The Reds, Yankees and A’s were the only three pre-1977 major league teams that never wore zippers. The 1937 Cubs were the first team to wear a zippered jersey, and as far we can tell the 1988 Phillies were the last to wear one. 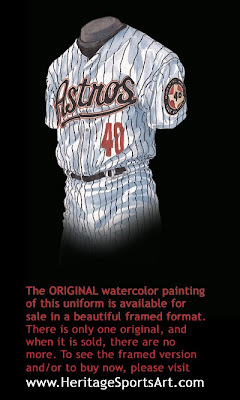 The Astros also got rid of their belt and went for the “Sans-a-Belt” look which featured an elasticized waistline, eliminating the need for a belt. The 1970 Pirates were the first double-knit - sans-a-belt team, and the Cards and Astros joined them in 1971. By 1975 two thirds of major league teams had succumbed. “HOUSTON” was written in red block letters across the front of this 1972 road jersey, while wide orange-red, white and black trim was added to the collar and sleeves. The patch on the left sleeve is the same as the last jersey we saw, with a color adjustment to suit the away uniform. The Astros wore this style jersey from ’71 to ’74. This season the Astros finished above .500 for the first time with their best record ever - 84-69. This was good for second place in the NL West - the Cincinnati Reds big red machine finished 10.5 games ahead in first. The Astros led the league in runs scored with 708, and in only his third year in the league, outfielder Cesar Cedeno led the league in doubles with 39 (shared with the Phillies Willie Montanez) and led the Astros with a .320 batting average, 55 stolen bases and 8 triples. You know what they say, “No rain, no rainbow”. Well there wasn’t any rain in the Astrodome, but there sure was a rainbow! The Astros introduce a brand new uniform this season, the “rainbow jersey” – perhaps the most original jersey in the history of major league baseball. As we see on this home uniform, a horizontal rainbow made up of several shades of orange has exploded onto the scene. The jersey is made of a double-knit style that most major league teams succumbed to during the 70’s and early 80’s. It was a pullover style, made of stretchy, synthetic material. The pants still have the “Sans-a-Belt” waistband that eliminated the need for a belt. Above the rainbow is the team name in a horizontal line, and on the left side of the rainbow is a large star, once again symbolic of the “Lone Star State”. The #40 patch on the left sleeve is in the memory of pitcher Don Wilson who died in the off-season after a 9 year major league career, all with the Astros. Note also the location of the uniform number - on the upper right thigh of the pants. The uniform number on the pants was a first for baseball when the Astros introduced it in 1972. 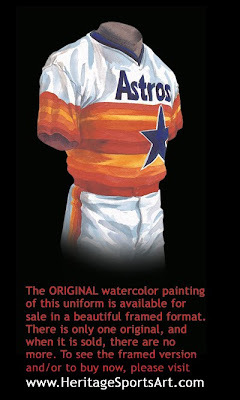 Even with the brand new bright uniforms, which should have distracted the opposing teams thus creating more wins for the Astros, the Astros sputtered. Houston would end up last in the National League (with a 64-97 record) for the first time since 1968. On a good note, the team led the NL in triples, (you have to look at the positive!) and a pitcher named JR Richard had blossomed into a bona fide major league pitcher with a 12-10 record, a harbinger of things to come. For those of you who know the story, sorry. But for those who don’t, JR Richard would go on to have 20-15, 18-12, 18-11, 18-13 and 10-4 seasons between 1976 and 1980 and he would start the 1980 all-star game, only to have his career abruptly ended before the end of 1980 by a paralyzing stroke. 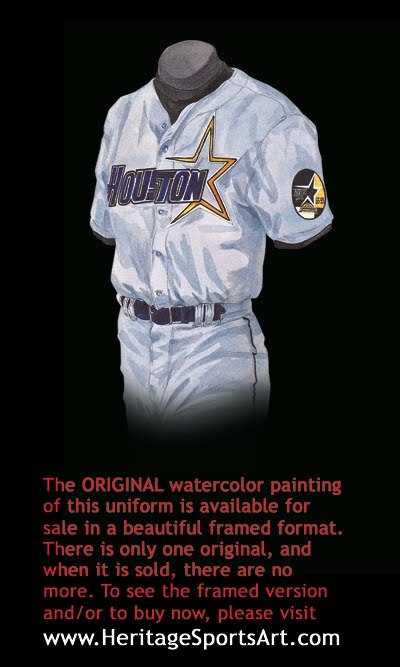 The Astros wore three different uniforms this season – depicted here is one of their home uniforms. It is pretty much the same as the 1975 jersey described earlier, but there are a few subtle differences. A white border has been added to the star, and the orange has been taken away from the collar, leaving only the blue. The rainbow pattern has also been subtly changed, and the uniform number on the upper right thigh has disappeared. The Astros would wear this uniform from 1983 to 1986. After the excitement of the team’s first post-season play in 1980, where they fell one win short of a National League Pennant when they lost to the Phillies in extra innings in the 5th and final game of the NLCS, the Astros were up and down for the next several years. In 1983 they finished third in the West, but had some great individual achievements from players such as the 14-9 Nolan Ryan, who joined the team in ’80 and took control of the career strikeout record from the great Walter Johnson this season, while Jose Cruz finished a close third in the batting title with a .318 average (Bill Madlock was first with a .323 average, and Lonnie Smith of the Cards hit .321). Don’t worry; the rainbow jersey was still around this year, we have just chosen to show the Astros’ road uniform for this season. The rainbow across the front has been moved to form a yoke from the collar down the sleeves, while both the pant stripe and the elasticized belt have lost their bright color, and are now simply blue and white. The patch on the left sleeve celebrates the Astros’ Silver Anniversary - 25 years of Astros baseball. The bigger news is that the Astros finished first in the NL West in 1986 with a 96-66 record, their best finish ever. They faced the New York Mets for the NL Pennant, but after leading the series 1-0 and tying the series 2-2, they lost the 6th and deciding game in dramatic fashion in 16 innings to the eventual World Series Champs. The Astros had a 3-0 lead from the bottom of the first all the way to the top of the 9th, when the Mets tied it. The score remained tied through the top of the 14th, when the Mets went ahead by a run. But the Astros refused to say die, and tied it in the bottom of the 14th. In the top of the 16th the Mets scored 3 runs, but the Astros answered with two runs in the bottom of the 16th and had two men on with two out when Jesse Orosco struck out Kevin Bass to end the inning, the game and the series. Manager Hal Lanier was honored with the Manager of the Year award, a first in the teams franchise. Pitcher Mike Scott won the teams’ first Cy Young Award with an 18-10 record, 306 strikeouts, 2.22 ERA and 5 shutouts (a record he shared with teammate Bob Knepper). Also this season, the Astrodome played host to the All Star game for the first time since 1968. A change in the uniform style was made in 1989, and we see it here for the first time with this 1990 home jersey. Thank goodness the buttoned front has made a comeback, and a normal leather belt has replaced the elasticized “sans-a-belt”. The rainbow stripe down the sleeves has stayed, but a blue border and blue cuffs have been added. The patch on the left sleeve commemorates the 25th Anniversary of the Astrodome. The team opened up the ‘90’s with very little to cheer about. Nolan Ryan signed with Texas in 1989, and the 1990 Astros finished fourth in the NL West, although pitcher Danny Darwin finished the season with a league leading 2.21 ERA and 11-4 record. This would mark the third time in the last five years that an Astro pitcher would lead the National League in earned run average (Mike Scott with a 2.22 in 1986, Nolan Ryan with a 2.76 in 1987, and Darwin with 2.21 in ’90). No more rainbow! The Astros have brand new uniforms this season as we see on this home jersey. They have gone back to the simple sort of look they once had in the ‘60’s, with a white background and no trim or piping on the jersey at all. For the 1994 season the team name is blazoned across the front with a shooting star filling in the hole in the “O”. 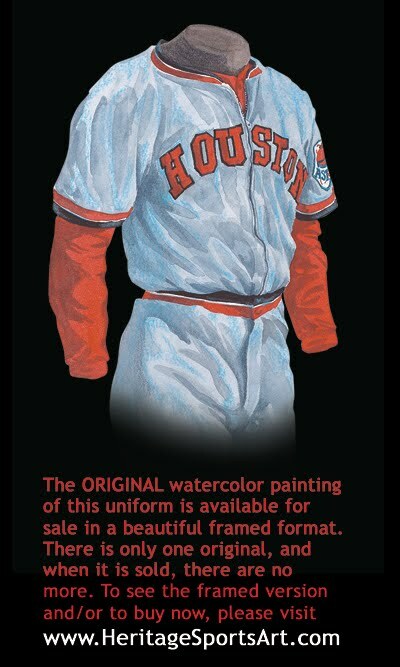 The patch on the left sleeve celebrates the Astrodome with a simple “The Original” statement beneath a sketch of the Dome. The 1995 jersey would have the same patch with an additional banner underneath “The Original” that read “’65 30th Anniversary ‘95”, celebrating the Astrodome’s 30th anniversary. In this, the year of professional baseball’s 125th Anniversary, there would be no World Series for the first time in 90 years, when a player lockout in August 1994 put an end to the season. The Astros were sitting in second place in the NL West with a 66-49 record, only a ½ game back of the Reds. In the shortened season Jeff Bagwell wins the NL MVP award (the first for an Astro) with a .368 average and 39 homers, and he led the league with 116 RBI, 104 runs and 300 total bases. Oh what might have been… What a shame. 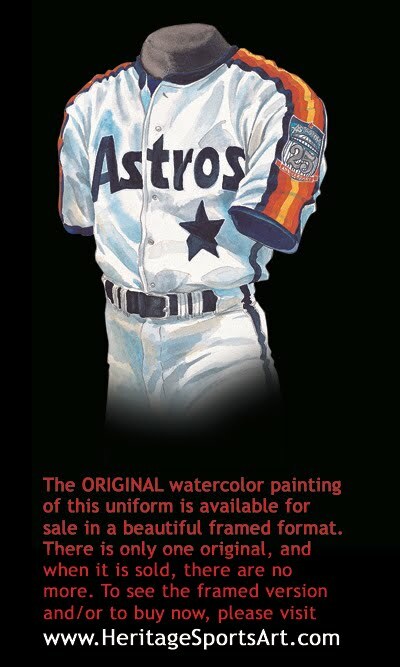 The Astros make yet another change to their uniform. As we see on this road jersey, the star has been lifted from being in the name of the team, to the end of the “HOUSTON”. The patch on the left sleeve marks the last season for the Astrodome, formerly the 8th wonder of the world, and says on it, “35 Great Years 65-99”. In the final season of the Astrodome, Houston finishes atop the National League Central Division for the 3rd straight time, this time beating the Reds by 1½ games. In what was considered to be an offensive team with the likes of the “Killer B’s” Jeff Bagwell and Craig Biggio, pitching was the story of the 1999 season. The Astros had two 20 game winners in 22-4 Mike Hampton (the league leader) and Jose Lima 21-10 (second in the league to Hampton). The 1999 Astros also finished atop the N.L. in fewest home runs allowed with 128, fewest walks allowed with 478, shutouts with 5 and strikeouts with 1,204. They played the perennially powerful Atlanta Braves in the Divisional Series, but lost 3 games to 1. We see another change in the uniform. Gone from the jersey are both the team name and the city name – leaving only a stylized star. 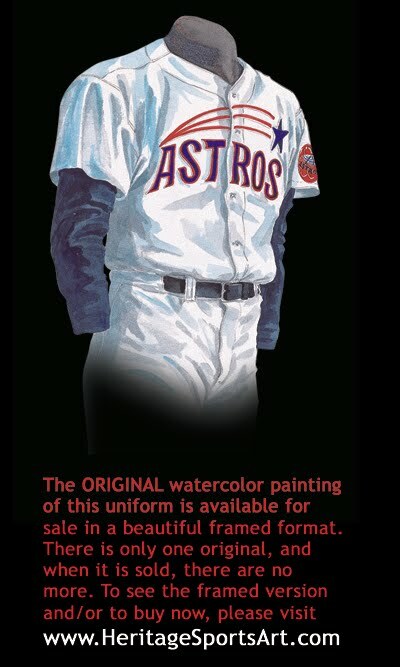 This is a beautifully simple jersey, as simple in design as the 1968 “shooting stars” Astros jersey. The patch on the left sleeve signifies the inaugural season of their new retractable roofed home, Enron Field, and says “Inaugural Season 2000”. The Astros opened the season at their new home, Enron Field, and over three million fans passed through the gates in 2000. The new ballpark features a retractable roof to keep the Texas humidity and mosquitos out that were such a problem in the Astros early days at Colt Stadium. But on the field the 2000 Astros can’t keep pace with their beautiful new home, and they finish a lackluster fourth in the NL Central. On a positive note, the Astros reverted back to their heavy hitting ways and led the league in home runs with 249. For the first time since the Colt .45’s became the Astros in 1965 there is no star on the front of the redesigned 2001 home jersey. The star seemed to be a staple to the uniform, but is only represented this season on the ball caps. The patch on the left sleeve celebrates 40 years of Colt .45’s/Astros baseball. The home uniform has gone from plain white in 2000 to pinstripes in 2001, the first time the Astros have worn pinstripes. As best we can tell, the first instance of pinstriped uniforms was in 1907. The Boston Braves road uniform were made from a gray flannel with a fine green pinstripe. Later that same year the Cubs had a new gray uniform with fine pin striping made for the World Series - they wore it for the World Series opener in Chicago and were later reprimanded by the league for not wearing a white uniform at home. The Yankees, most often associated with pinstripe uniforms, first wore a pinstriped uniform for one year at home in 1912 (the New York Times wrote about their 1912 home opener “The Yankees presented a natty appearance in their new uniforms of white with black pin stripes”), then every year from 1915 to the present. The 2001 Astros home jersey also features a “swoosh” underlining the team name, another 2001 first. This style was introduced to baseball by the 1932 Cubs, and has been worn by many teams since then. 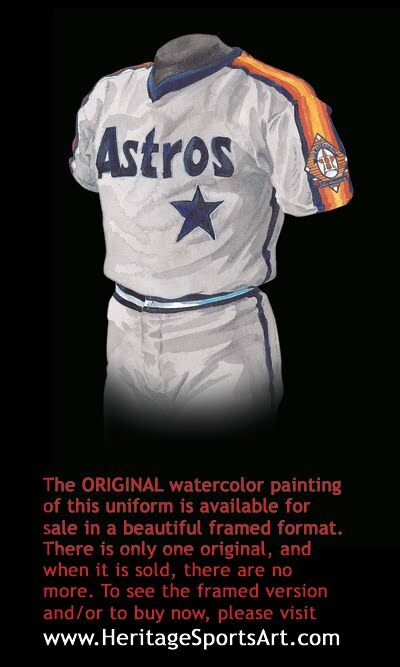 Finally, note that the uniform number has been added to the front of the jersey itself, something we are seeing again for the first time on an Astros jersey. Uniform numbers first made their appearance on the front of a uniform in 1952 - the Brooklyn Dodgers were the first team to wear uniform numbers on the front of their jersey. The Braves followed suit in 1953, and the Reds joined in beginning in 1956. The 1916 Cleveland Indians actually wore a uniform number on their sleeve, but it wasn’t until the ’52 Dodgers that the number made it to the front. 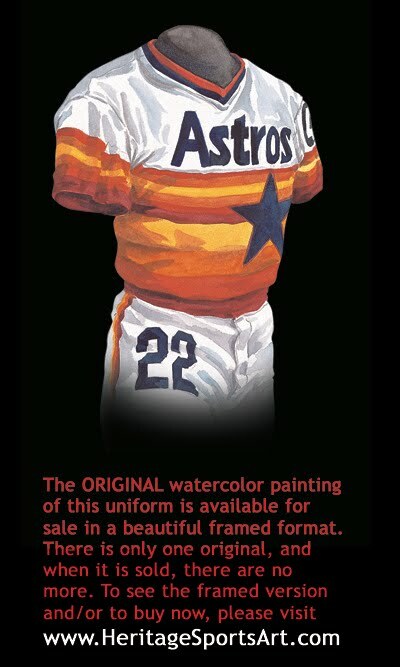 And of course, we can’t forget that the Astros themselves were the first team to wear a uniform number on their pants when they did it in 1972. Following the 2003 season the Astros signed Houston natives and former Yankees Andy Pettitte and Roger Clemens who had won a combined 38 games with the Yankees in 2003. The signing of Clemens took some by surprise as during the 2003 season and post-season he let it be known that that was going to be his last season. But the allure of playing in his hometown in front of his family and alongside his good friend Andy Pettitte was too much for Clemens (and perhaps it had something to do with the $16mil a year), and he signed a two-year contract with the Astros. After finishing the 2003 season in second in the NL Central with a record of 87-75, one game behind the Cubs, the club felt by adding Pettitte and Clemens they had enough to get them into the 2004 postseason. And it worked! After a wild ride, the Astros finished the 2004 season with a 92-70 record, good enough to win the NL Wild Card berth in a real nail biter - more on this in a moment. Their season was not without its ups and downs. Andy Pettitte would suffer an elbow injury in his first start that would affect him the entire season. He spent most of the season on the Disabled List and posted a 6-4 record in just 15 starts. But the remarkable and ageless Clemens would not disappoint - he was dominant from the start of the season. He won his first 9 decisions on the way to an 18-4 record with a 2.98 ERA and 218 K’s. He passed Steve Carlton for 2nd on the career strikeout list on and won his record-setting 7th Cy Young award, his first in the Senior Circuit. The Astros had a 44-44 record at the time of the All Star game, a game they hosted at Minute Maid Park. Jimy Williams, in his 3rd year with Houston, was booed by his hometown fans when he was introduced as a coach for the NL squad. The fans were upset because after winning 21 games in their first 32, the Astros won only 23 of their next 56 and Williams was held accountable. A day after the game Williams was fired and replaced by former Tigers skipper Phil Garner. The Astros continued to slump after Garner took over; they were 4 games below .500 by mid August. As September began the Astros got hot and put together a 12-game winning streak. They won 22 of 26 games to become a late entrant into the race for the Wild Card. Down the stretch the Astros were even hotter winning 9 of their last 10 including their final 7 games to capture the Wild Card berth by 1 game over the San Francisco Giants with a record of 92-70. Houston opened the post season against the Atlanta Braves, a team that has eliminated them from the playoffs in 1997, 1999 and 2001. The Rocket led the Astros to a series-opening victory 9-3. The two teams alternated victories until the 5th and deciding Game 5 in Atlanta when the Astros beat the Braves in a 12-3 laugher. This would be the first playoff series win in the Astros’ history. Despite the victory a pall was cast over the series when news of former NL MVP, Astros and Braves 3rd baseman Ken Caminiti was found dead of a drug-induced heart attacked in a run-down part of New York. The ‘Stros advanced to the NLCS where they faced the powerhouse St. Louis Cardinals. Carlos Beltran, who the Astros acquired in a mid-season deal, got hot in a hurry, homering in the first inning of the first 2 games. However it wasn’t enough as the Astros lost both games and needed a strong performance from Roger Clemens in Game 3 in Houston just to stay alive. Clemens delivered; getting his team back into the series with a strong 7-inning effort as him team won game 3 by a 3-1 count. Houston would then win Games 4 and 5 to take a 3-2 series lead back to St. Louis. But Tony Larussa’s veteran team would regroup and win Game 6, 6-4 and Game 7, 5-2 on home soil to win the NL pennant and advance to the World Series against the Boston Red Sox. Roger Clemens pitched Game 7 for Houston, but he could not hold off the Cards’ offence giving up 4 runs, all earned, on 6 hits, in 6 innings-pitched. 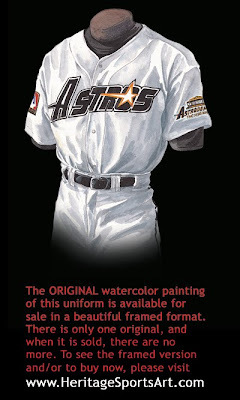 This 2004 Astros jersey is the team’s alternate road jersey - they have a similar alternate jersey for home but it says “Astros” across the chest. 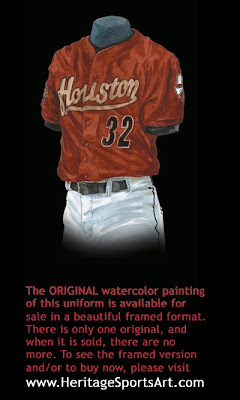 This jersey style was introduced in 2002 when the Astros eliminated their black alternate jersey and brought in this “brick red” jersey. The sleeves on this jersey showcase two patches. On the right sleeve is a patch commemorating the 2004 All Star game that was held at Minute Maid Park, and on the left sleeve is a patch of the Astros’ state-of-Texas logo.